At the core of the G&N system was the Apollo guidance computer. Now seen as primitive in comparison to its successors, it was nevertheless one of the items in the Apollo programme that helped to drive forward important technologies in electronics and computing. It demanded compactness and low power consumption, allied with high computational power - capabilities that could only be performed by a new device that was just coming out of American research laboratories: the integrated circuit or 'chip'. When production of computers for the Apollo programme was at its peak, it consumed fully half of the world's output of integrated circuits to construct only the 75 units that were built between 1963 and 1969. It is common for the Apollo guidance computer to be compared with modern domestic computers. More often, people display incredulity that a task perceived to be as complex as a mission to the Moon could be achieved with a computer no more powerful than a digital watch, pocket calculator or some other lowly item of electronic hardware. This is to misunderstand the nature of computers and how they work. Though limited in resources, the Apollo computer was carefully programmed at the machine code level. It did not require huge resources because its functions were very narrowly defined. The layers of abstraction that go into modern programming, where a high-level language has to be translated to a lower level of coding, were largely unnecessary, and computing power was not required to support sophisticated ancillary devices such as video displays. There was no word processor, spreadsheet, or even a simple decimal calculator, and it lacked even a QWERTY keyboard. Rather than make comparisons with modern stand-alone computers, the Apollo machine is better thought of as being like an embedded controller, tightly integrated into the spacecraft systems around it. In hardware terms, too, it can be difficult to directly compare then and now. There was no one-chip processor at the heart of the machine. The processing unit was a card full of simple chips whose processing cycle was a seemingly meagre 80,000 cycles per second. The data moved about the machine, arranged as 15-bit words (plus a parity bit to detect errors) whereas computers from later generations settled on 8, 16, 32 or even 64 bits. Its sparse memory was very carefully and efficiently programmed with an extensive range of routines to assist the crews with the operation of their spacecraft. There were a total of 44 programs in the case of Colossus III - which was the name given to the software loaded into Apollo 15's command module computer - packed into the equivalent of about 64 kilobytes of computer memory and stored on hand-verified, machine-wired core rope, an archaic memory technology that is no longer in use. The crew 'spoke' to the machine in a language of programs, verbs and nouns. Programs were numbered in groups according to the broad field of operation with which they were concerned. For example, programs used for the spacecraft's descent to a planet's surface were numbered in the range 61 to 67. Four programs for aligning the guidance system were numbered from 51 to 54. The selection of these programs and the functions they offered were not arrived at easily. As Apollo went through its gestation, engineers, planners and crews wanted the computer to handle an ever-increasing range of tasks, but had a poor grasp of exactly how these should be achieved. Soon programmers complained that the meagre memory available to the computer was filling up, causing management to set up an elaborate bureaucracy to carefully define what was essential, how best to achieve it, and what could be left off the machine. In truth, the computer was always running a number of programs simultaneously in order to carry out background tasks such as updating the state vector, but one program was dominant at any one time, and was known as the major mode. The crew could call up a program as necessary, or in some cases one program could call up another. The crew gave the computer instructions using numerical codes called verbs. For example, Verb 49 was an instruction to automatically manoeuvre the spacecraft to a new attitude, and Verb 06 instructed the computer to display a requested value in decimal form. Any value that the crew might wish to access was given a name, called a noun. Each noun was a numerical code that led to a value or a set of values stored in the computer. For example, during launch, the crew ran Program 11 and punched in Verb 06, Noun 62 which asked the computer to display, in decimal form, three values that told them their speed, their height and how rapidly that height was changing. All interaction between the crew and the computer was by way of a dedicated display and keyboard, affectionately known as the DSKY and pronounced 'diss-key'. 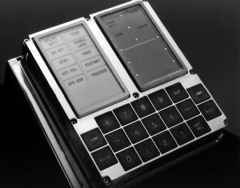 This had ten numerical keys, a plus key, a minus key and seven other control keys that allowed the crew to engage in a dialogue with the computer. Above the keyboard were a cluster of lights to indicate the status of the machine and an arrangement of seven-segment displays, stacked vertically. Three of these displays, each with five digits, allowed the crew to enter data into the computer, or let them read the result of the computer's efforts. To keep the machine's programming simple, there was no facility for the decimal point. Number entry and readout could be in octal or decimal and was pre-scaled with the position of the decimal point assumed. It was left to smart astronauts to know where it was. Apollo crews came to respect the computer's reliability and capability. David Scott said in 1982, ''With its computational ability, [the computer] was a joy to operate - a tremendous machine. You could do a lot with it. It was so reliable, we never needed the backup systems. We never had a failure, and I think that is a remarkable achievement." A display and keyboard (DSKY), a crew's interface with the computer. systems were aimed; it could start and stop the engines; and it could adjust the spacecraft's attitude based on the reference it gained from the gyroscopically stabilised guidance platform, i.e. its knowledge of which way was up. The computer in the command module was called the CMC, for command module computer. The lunar module had an essentially identical machine, the LGC or lunar-module guidance computer, which necessarily operated a different version of the software, named Luminary. Programming had to be specific to the tasks that were relevant to the spacecraft. For example, the LGC had to handle the lunar landing whereas the CMC needed routines for Earth re-entry. 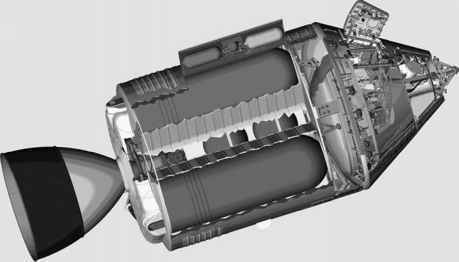 Also, the systems into which the computer was integrated were substantially different; for example, whereas the CMC only needed to start and stop the SPS engine, the LGC needed to control the throttle capability of the LM's main engine. They were not interchangeable. The optics, described previously, formed the second part of the system in the command module. The sextant and telescope were not only useful for navigation, but being motorised they could also be commanded to sight on landmarks and track them to maintain the line of sight as the spacecraft passed overhead. The sextant's optical power and tracking capability were such that a crewman in the command module could peer through its eyepiece and, if the coordinates were correct, see his colleagues' landing craft on the lunar surface while passing more than 110 kilometres above at a speed of nearly 6,000 kilometres per hour. Moreover, he could take marks that allowed the exact position of the lunar module to be calculated and refined. The third major element of the guidance and navigation system defined which way was up.